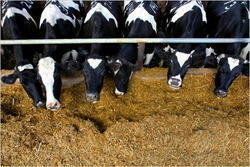 We are a leading Manufacturer of animal feed from Mumbai, India. Owing to our rich industry experience, we have been able to offer our valuable clients supreme quality Animal Feed Supplement. Further, the offered feed supplement is precisely processed by our adept professional in sync with the pharmaceutical industry norms using superior grade ingredients. Also, we have hired a team of quality controllers who test the entire range on various parameters of quality. Further, our esteemed clients can avail this feed supplement from us at industry leading rates.